Gourmet milk chocolate wrapped in colorful foil. 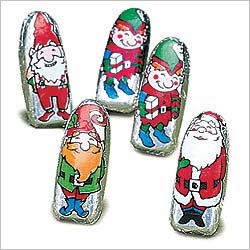 Assortment includes 6 fun designs (Santa & 5 different elves)! An ideal addition to any fabric or wooden Advent calendar. Also great for stocking stuffers, place settings, party favors, gift tie-ons and holiday candy dishes. Approximately 6.0 oz. total chocolate. I bought these for my wooden Advent Calendar and they fit perfectly. The milk chocolate was so yummy that we looked forward to opening each day so we could eat our candy. You won't be disappointed in these chocolates.